Greg Harlow beat Jason Greenslade in a tense tie-break to win the Scottish International Open for a second time. 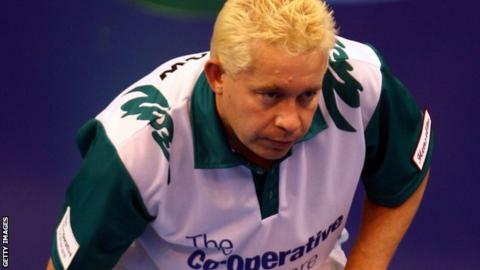 The 47-year-old Englishman ran away with the first set, winning five of the last six ends for an 11-4 success. But his experienced Welsh opponent dug in to win the next 8-6 at the Dewar's Centre in Perth. Greenslade struck first in the tie-break but misjudged the final bowl of the contest with the jack in the ditch to hand Harlow a 2-1 victory. Harlow, the 2008 champion, did a cartwheel to celebrate, telling BBC Scotland: "It's a longer format in the final, so you need to pace yourself and try not to play too much risky stuff early on. "There was really nothing between us. I just got a break of two or three ends in the first set. "The second set, I'm desperate to win 2-0 because I know how deadly he is in a tie-break. "To leave anyone with a shot for a take-out, I'm thinking it's Jason's, so there was relief at the end as it slipped past wide. "The game went pretty much as I thought, we both draw well, we both convert well, and then it was down to the last bowl on the last end. One of us will be happy and the other left scratching their head."